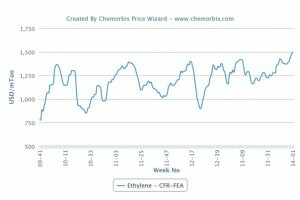 According to data from ChemOrbis Price Wizard, Asian spot ethylene prices hit their highest levels in almost four years. In October 2009, spot ethylene prices were reported at three digit numbers while as of the first week of 2014, spot ethylene prices on CFR Northeast Asia basis reached over $1500/ton. 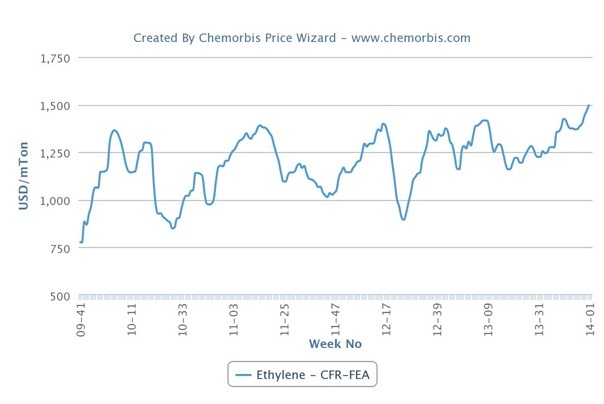 Looking at spot ethylene costs on a week over week basis, they indicate around $30/ton increases when compared with the previous week. Tight supply levels in Asia were pointed to as the main reason behind these recent hikes despite the ongoing holiday lull in the region. Some major players in Japan were reported not be back to their desks during this past week due to the New Year holiday. Looking at China’s import PE market, with the exception of LDPE film prices, offers for PE including LLDPE film, HDPE film and blow moulding are below the theoretical PE production costs based on the current spot ethylene prices. According to ChemOrbis Price Indexes, the average import LLDPE film price in China is $70/ton below the current theoretical PE production costs. Meanwhile, HDPE film prices are $110/ton and HDPE blow moulding prices are $175/ton below the theoretical costs. In China’s PE market, general expectancies are about mostly steady market levels for January. Although demand is likely to slow down gradually given the approaching Chinese New Year, strong upstream costs are to support sellers on their firm offer levels.